This was a one-off graphic novel about the philosopher Bertrand Russell’s quest to discover a logical basis for mathematics. Bertrand Russell is one of those famous Englishmen who I’ve always been hazy on (anti-war activist?) and I’ve forgotten most of my history of philosophy, so I was surprised to discover fun facts herein, like that Wittgenstein was a contemporary, and heavily influenced by Russell, and that the term “Boolean,” which I’m familiar with from search terminology, refers to a mathematician named Boole. The book also seems to share the neither-fish-nor-fowl niche of popular books about mathematics shared by David Foster Wallace’s “Everything and More”, since the two books are “popularly bought together” according to my Amazon. 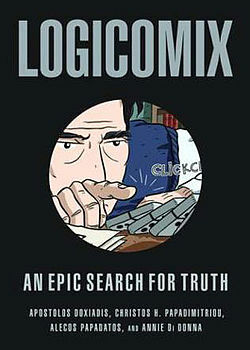 Unlike Wallace, the Logicomix authors have chosen to shy away from any math or logic concepts likely to bend the reader’s brain, which for me would have made it more interesting. Also there’s a bit of a mystifying and so-what meta layer about the guys creating the book (tension? resolution? arc? character development? hello?). Still, I found it enjoyable as a quick read. My biggest problem with the book was that the illustrations didn’t have much facial expression for the characters (see the dead eyes on the cover, above). Traditional comic book fans might not mind, but my taste in graphic novels runs towards writer-illustrators like Charles Burns and Alison Bechdel, who are so expressive everyone else feels wooden by comparison.